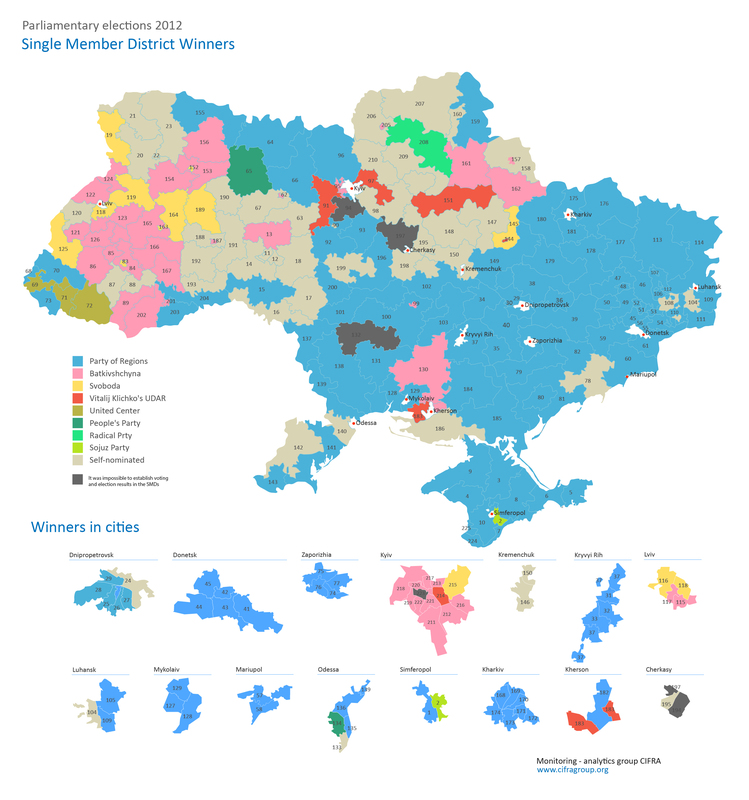 As part of our continuing series of Monkey Cage Election Reports, the following is a pre-election report on Ukraine’s upcoming parliamentary election by political scientists Erik Herron of West Virginia University, and Nazar Boyko of CIFRA Group. On Aug. 25, Ukrainian President Petro Poroshenko signed a decree dissolving parliament and calling early parliamentary elections for Oct. 26. Ukraine faces several critical issues to ensure that the next round of elections goes as smoothly as possible, notably administering elections in regions of instability and addressing the implications of changes in the partisan landscape. Ukraine’s last parliamentary elections, held in 2012, used a mixed electoral system to select the 450 members of the Verkhovna Rada. The rules divide the seats into two tiers: 225 members of parliament are chosen using single member districts with a plurality rule (as in the U.S. House of Representatives) and 225 are selected in a single national district by proportional representation. At the polls, voters have two ballots: one to select their local representative and another to select a political party. While politicians have discussed the adoption of new election rules, it seems likely that the mixed system will remain in place for October’s election. A significant consequence of retaining the mixed system is that all of the seats cannot be filled in October. Twelve seats dedicated to districts in Crimea and the city of Sevastopol will be vacant and some in Donetsk and Luhansk may be unfilled as well. However, districts that participate in the election must declare the results of voting, regardless of the number of polling stations where voting was declared invalid (Article 95 of the election law). In principle, if only one polling station were to be functioning in a district properly, it could determine the winner. With active combat in many districts of Donetsk and Luhansk, the election could generate suspicious results and challenges to its legitimacy. In the 2014 presidential election, only 15.1 percent of eligible voters in Donetsk and 38.9 percent in Luhansk participated. Moreover, many district electoral commissions (DECs) that manage regional election administration and precinct electoral commissions (PECs) that manage the voting process were unable to function in the May presidential contest. No results were reported in 14 out of 22 districts in Donetsk, 10 out of 12 in Luhansk, and across the 12 districts in Crimea and Sevastopol. Election administrators may face issues of staff recruitment, in addition to safety and security, for the parliamentary elections. These conditions may provide stronger incentives for fraud and manipulation than were present in the presidential election. During the presidential election, one of the authors worked with the Committee for Open Democracy, a U.S.-based NGO that fielded the sixth-largest international contingent for the presidential election and the largest for the local elections. CfOD observers were generally sent to areas of the country where problems were anticipated to be more prevalent due to separatist activity (e.g., Donetsk) or contentious local races (e.g., Odessa). Outside of Donetsk, the majority of reports indicated that PECs were functioning normally. Technical problems occurred largely due to high turnout and discrepancies between the State Register of Voters, developed to ensure accurate voter lists for national elections, and local voter lists. CfOD observers noted problems with voter lists in 21 percent of the polling stations observed. PECs also struggled with long lines (CfOD teams indicated that they observed long lines in 28 percent of polling stations). Concurrent local elections held alongside the presidential election seemed to be the primary source of concerns about manipulation. While the local elections garnered less international media and observer attention, hotly contested mayoral and council races were held in many regions. Most of the concerns raised by officials and observers about election integrity in Cherkasy, a city south of Kiev, related to local contests. 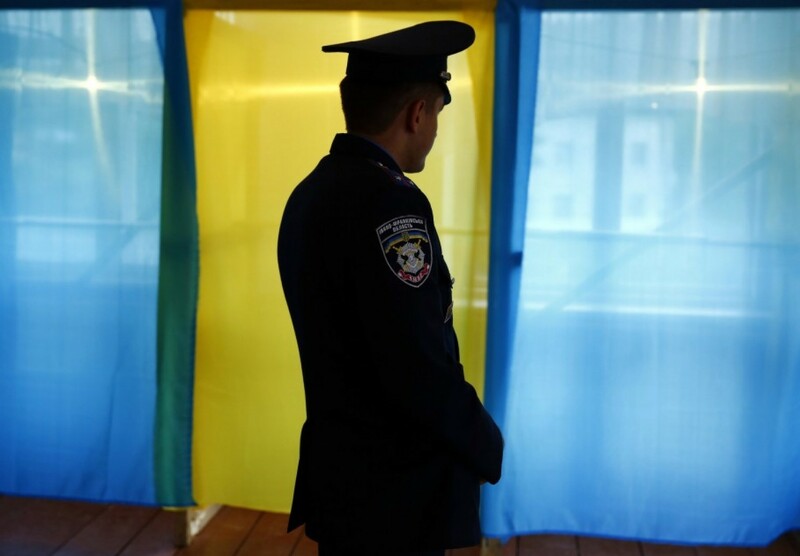 Following the election, the Cherkasy City Election Commission, responsible for aggregating local results, was removed en masse for violations of the election law. Allegations of misdeeds were also leveled in other cities, such as Odessa. Unlike the presidential election, where Poroshenko’s victory was considered by most to be a fait accompli, local elections offered uncertain outcomes, valuable spoils for the winners, lower thresholds to win, and less international scrutiny. These features increase the potential payoffs for manipulation and may be repeated in early parliamentary elections, especially because of changes to the partisan landscape. The results of the last parliamentary election, held in 2012, provide some hints about what is likely to await Ukraine in October’s snap election. The map above shows the winners of district races in the 2012 parliamentary election by their party affiliation. 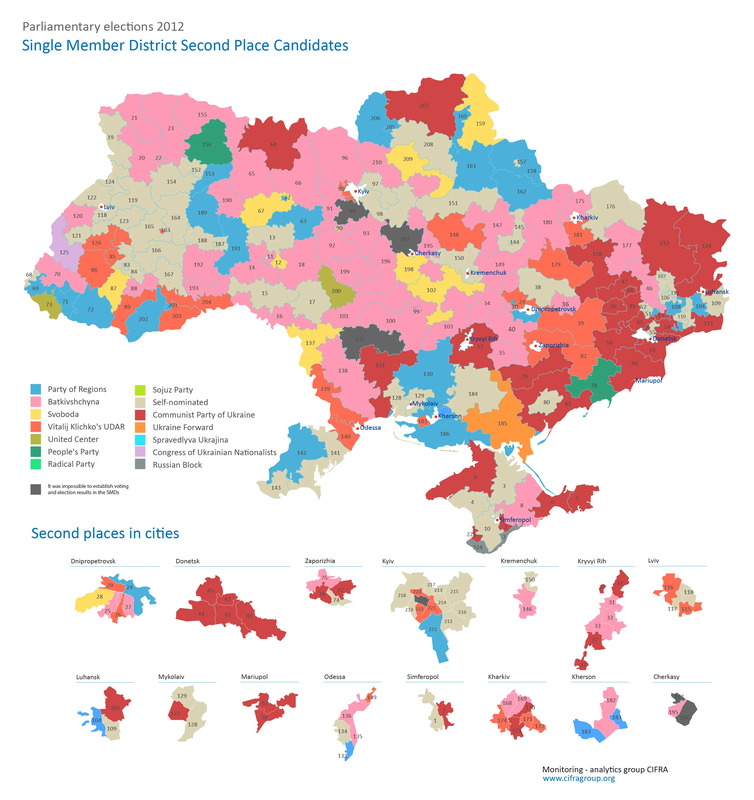 Many districts in the eastern and southern regions, as well as several in the central and western regions, were won by affiliates of the Party of Regions, Viktor Yanukovych’s party-of-power at the time. Since Yanukovych’s ouster, the political and financial networks that made up the core of the Party of Regions have been in disarray. 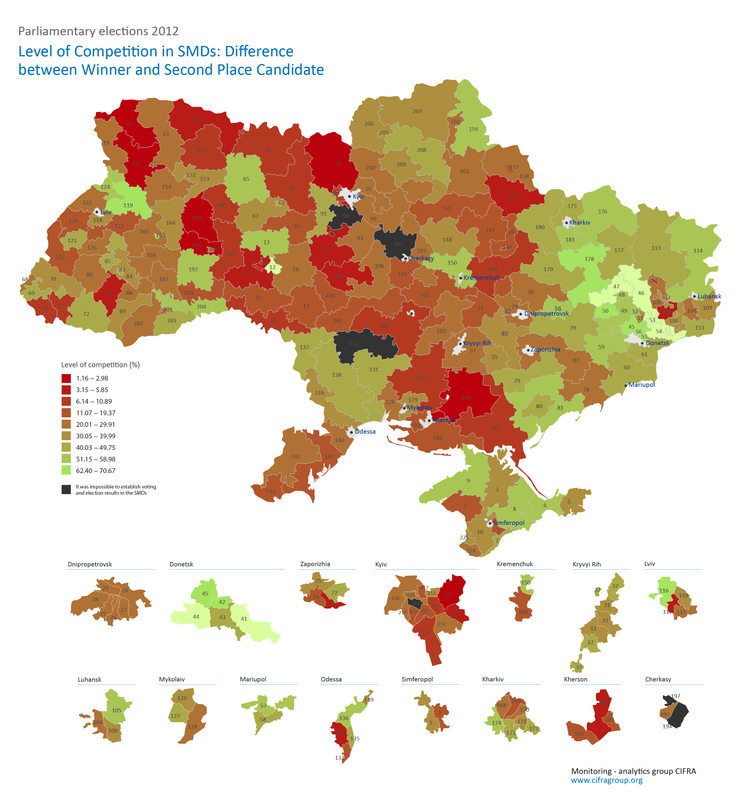 The map below shows the level of competitiveness in the 2012 election. In much of the east, the Party of Regions won seats with strong majorities; in other parts of the country, their victories were more tenuous. While locally-powerful politicians who were affiliated with the Party of Regions may gain seats in eastern districts under a different party label (or as independents), many of the more competitive seats will be up-for-grabs. The final map below shows the affiliations of the second-place candidates in all districts. A diverse array of parties garnered second place positions in 2012, and in many Party of Regions-dominated areas, the Communist Party (CPU) was in second. While the CPU would, in principle, be a strong contender for seats in many Party of Regions strongholds, the CPU has also been challenged in post-Yanukovych Ukraine, with some politicians calling for an outright ban on its participation in politics. On July 24, the speaker of Ukraine’s parliament announced the dissolution of the CPU faction in the Verkhovna Rada as the faction did not meet the minimum threshold of representatives (23) to maintain its status. The dissolution has affected the CPU’s participation in the current electoral process. According to the election law, parliamentary factions have guaranteed seats on each DEC and PEC. In the upcoming elections, the CPU will be deprived of guaranteed representation. The party system has been strongly affected by the end of the Yanukovych regime and the events of the last few months, and it remains unclear precisely how candidates and parties will participate in the elections. Some of the remaining fragments of the Party of Regions have been reorganized into the Party of Development of Ukraine, led by Yuriy Miroshchnychenko (a former member of the Party of Regions). Another new party-project, called Industrial Ukraine, was registered at the beginning of June, and its formal leader is the general director at oligarch Rinat Akhmetov’s company Zaporizhstal. In addition, Serhiy Tihipko has renewed his party Strong Ukraine that had previously merged with the Party of Regions. The former opposition parties have also reorganized. On Aug. 25, Yuliya Tymoshenko’s Batkivshchyna Party held a party congress that featured the unexpected departures of Prime Minister Arseniy Yatseniuk, Parliamentary Speaker Oleksandr Turchynov, Minister of Internal Affairs Arsen Avakov, Minister of Justice Pavlo Petrenko, and others. It is not clear how these influential politicians will participate in the elections. Two days later, Petro Poroshenko renamed his Solidarity Party into the Bloc of Petro Poroshenko to be led by former minister of interior Yuriy Lutsenko. Lutsenko had been imprisoned by the Yanukovych regime under charges widely believed to be political in nature. The general expectation was that a Poroshenko-branded party could earn around 30 percent of the vote and perform better than the lesser-known Solidarity brand. This shake-up of the party system creates a murky environment for voters and candidates. In 2012, the identities of the party of power (Party of Regions) and opposition (Batkivshchyna, UDAR, and Svoboda) were clear. The opposition agreed to some coordination in district races, notably between Batkivshchyna and Svoboda, but its failure to coordinate may have cost it 21 or more SMD seats that were instead won by the Party of Regions and independent candidates. In 2012, negotiations over coordination began four months before election day; with less than two months and no outward signs of negotiations, the level of competition is likely to be fierce among party-nominated and independent candidates. While efforts at coordination could be taking place behind the scenes, Ukraine could also face a “war of all against all” in the districts. Even if a proposed cease-fire holds, the 2014 snap parliamentary elections may be the most challenging that Ukraine has faced. “Separatists” supported by a Russian invasion in the east may disrupt the elections by preventing the vote, or by making efforts to manipulate outcomes. Violence has displaced hundreds of thousands of Ukrainians, disrupting their lives and threatening their ability to participate. In addition, ensuring that members of the military may exercise their rights while they are in active combat conditions away from their home districts will be a daunting task. Unlike the 2014 presidential election – but similar to the 2014 local elections and 2012 parliamentary elections – many of the races are up-for-grabs. Perpetrators of fraud will have greater opportunities and stronger incentives to be increasingly active, especially in the constituency elections. The final election results are likely to yield a divided parliament that could further undermine political stabilization. For a country that has faced an existential threat to its sovereignty over the past few months, the parliamentary elections may become a source of greater anxiety over the country’s future as politicians and parties furiously fight over the spoils.